I've recently found myself car-less. Wha-wha-wha....yes I know this is 100% a first world problem, but I'm finding it hard to adjust. I'm committed to giving living without a car at least a month before I even consider whether I should get a new car. The telling point will be the first time I go grocery shopping. Keep me in your thoughts. Luckily I'm cute as hell! Last time I wore this dress with burgundy accessories, going outside my comfort zone. Today I just stuck with the black, green and yellow motif. Today was one of those days where people were really trying my patience. Luckily I have good coworkers and friends who can talk me down when I'm contemplating jumping off the building. And with that, let's turn out back on this perfectly frustrating day. I loooove those boots, but then again I like all your footwear. When I lived in Toronto, I sold my car but Seattle is a less bus-friendly city. Or maybe I'm getting old and grumpy. I do enjoy walking. Oh, take a backpack to the grocery store--your arms will thank you :) Hope your day improves - thankfully you have great coworkers! I've never had my license, much less a car. Go to a grocery store that delivers! It's awesome! I walk 10 minutes to my store, do all my shopping in person by 2pm (so I can go for brunch before or after, or do a little shopping for me) and be home by 4pm when they start delivering. It's great! And it's free! Now, the outfit - I love the boots. Holy smokes, those are crazy cool. I never see boots like that here. 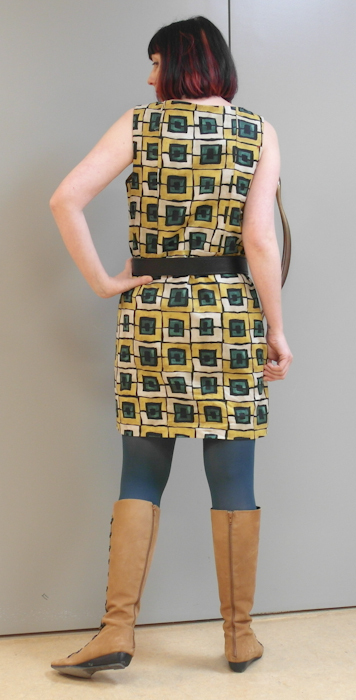 They work nicely with the graphic motif on the dress. Only 2 days to go! You can do it, Megan! We are a car free household and manage kids, shopping, and life in general just fine - give it a go! 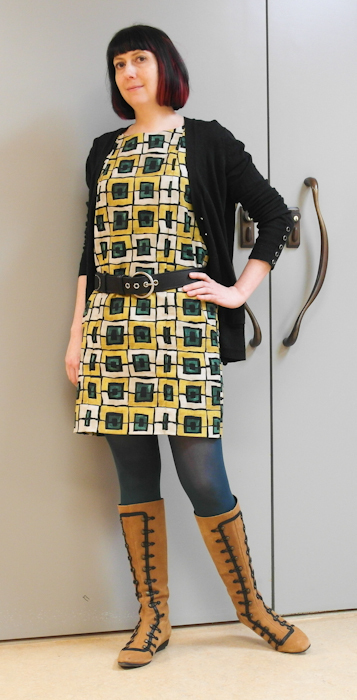 Still loving the print on that dress and the boots are amazing! Car, schmar, you super-cute lady! Love those boots and your grommety-ness. All best with your wheels-free experimentation. Don't get another car! Another non-driving person here. Just have decent bags to carry food shopping home in, (or like Sheila suggested, get it delivered). I like walking though, and in my city, it gets very gridlocked so you often can out-walk the cars. Love this outfit, the pattern on the dress is amazing.